Our versatile chrome wire shelving systems create the perfect opportunity to get creative when it comes to home storage! 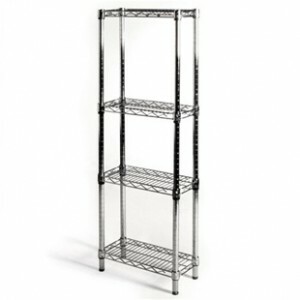 Customize your chrome wire shelving unit based on your storage and space needs. With chrome wire shelving accessories you can develop and customize your chrome wire shelving to almost anything, even your important documents. To get you thinking creatively, here are a few suggestions to get the most out of your Chrome Wire Shelving system. If you have limited bathroom space, corner shelving can be an excellent addition so no space goes wasted. Chrome wire shelving is a great addition to your home because it can be used in any room and is beautiful and functional and does not collect dust so rooms stay organized and clean. Pantry storage is a breeze with chrome wire shelving. Even add chrome wire wine racks to hold wine or even pop bottles, creating more kitchen space. You can add a modern look to your entertainment system with chrome wire shelving. Use different units to holding your TV, DVD player, Blu ray player, CD player, and even all your video games and DVDs. How will you be creative with your Chrome Wire Shelving Unit?